I love my Kitchen Aid mixer. I really, really do. 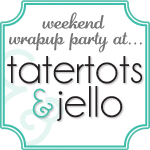 Together we've made countless birthday cakes, learned to make perfect homemade bread, and so much more. She was just a plain old white mixer when I brought her home. I was a little afraid to get a trendy color in case I ended up hating it one day. Because these babies last forever! I was excited a few years ago to get this awesome subway art style vinyl lettering from the House of Smiths shop to jazz her up a bit. She was cute, all white with black lettering like that. The vinyl has really held up well through several major scrubdowns, but I got to thinking that I might be ready to take it to the next level. 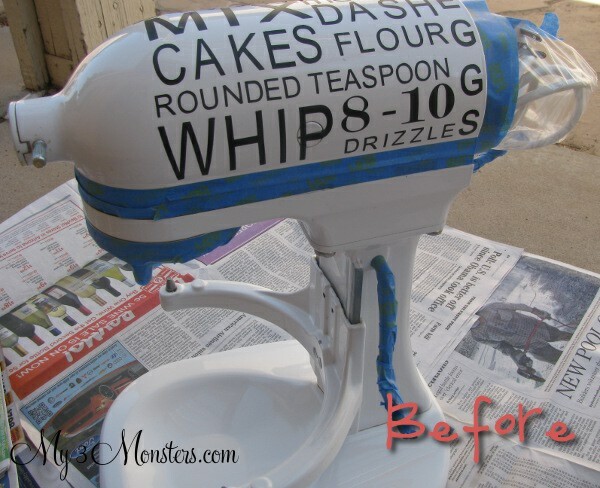 Maybe a new color or an all-over painted pattern -- I've seen several really cute ideas online like polka dots or zebra. While the polka dots were really tempting, I decided to stick with the subway art design and just spray a different color over it. This is probably the easiest, scariest project I have ever done. I was so afraid I was going to mess it up and make it look terrible. I'm soooo glad that I did it though because I LOVE the results. You can see in the picture above that I undid a couple of screws -- one to remove the piece at the back that covers the wires and motor and stuff, two that held the metal band that says KitchenAid on, and two that held the bowl clip on the front. Then I cleaned the mixer really, really well, removing cake better splashes from several years ago, I'm sure. I also taped up the areas that I didn't want to get painted. I used a ziploc bag to cover the cord and then taped it up to cover the wires and motor and stuff. Before I started spraying, I also made sure all the corners of the vinyl letters were pressed down really good. 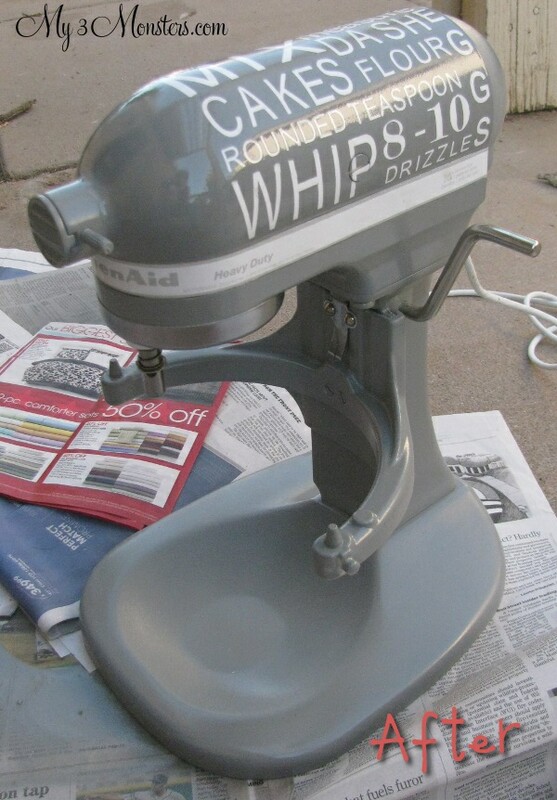 Using a really good Rustoleum spray paint, I sprayed several light coats of gray over the entire mixer. If you have the same model I do with the bowl that raises up, make sure you spray it with the bowl in the up AND down positions or else you'll be sad later when you use it. I let the paint dry for about an hour before peeling off the vinyl lettering. Despite my prepping, some of the letters were a tiny bit peel-y so I had a bit of overspray (or is it underspray) on a few letters. I was able to use my fingernail to gently scrape it off so the design looked perfect. I adore her new look! 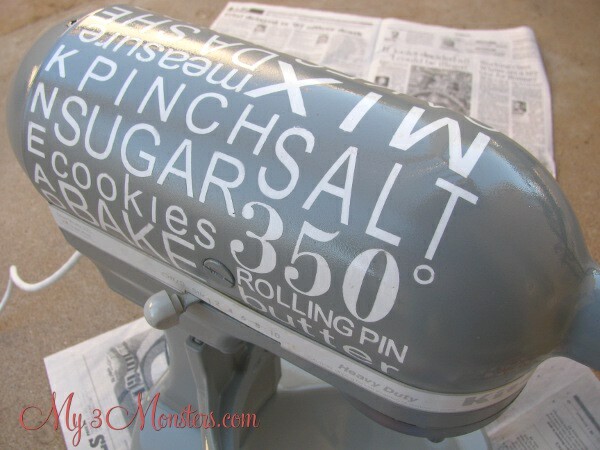 I'm going to give the paint a few days to really cure before I get back to baking. I can't wait to work with her again!! Have a great weekend, friends! WOW! You are really brave! But it paid off, it looks great! I would be so nervous to do this...but it looks so neat! 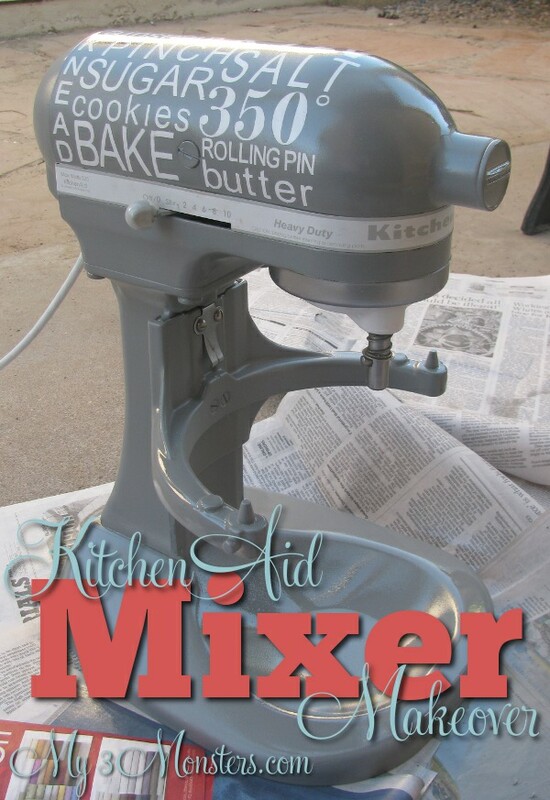 I love my KitchenAid, too...best thing in my kitchen!